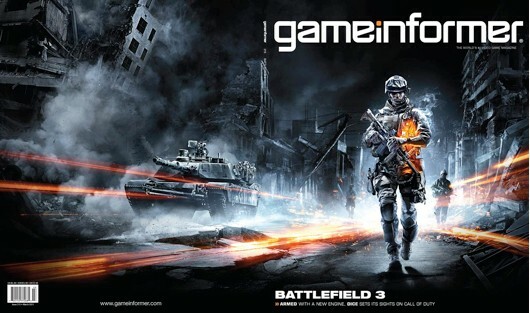 Battlefield 3 is about to step out from under DICE's secretive cover -- and onto a magazine cover. The game is featured in the next issue of Game Informer, and the game's official site is expected to host a teaser trailer tomorrow. The title will utilize DICE's Frostbite 2 engine, which promises numerous visual enhancements (see: deferred rendering, real-time radiosity), a new animation system that originated from EA Sports, and environments that are more destructible than ever before. The developer made it clear today that it had canceled other projects in order to focus on making Battlefield 3 "the best Battlefield game ever." Battlefield 3 is expected to launch on PlayStation 3, Xbox 360 and PC. We're already eager to see how how all that fancy technology holds up across three different platforms. Building a new PC over the summer. Seems like I'm just in time. awesome, they have some big expectations after this last game!! I want it now, can't wait to try the Beta! Gonna get it on PC or console ? Reading through the game is going to be amazing on PC as expected DICE is a pc dev first and foremost. Last edited by NJDEVIL30274; Feb. 8th, '11 at 7:20 am. they started on the pc but they did cancel BF1943 and OnSlaught for the PC to focus on BF 3, having said that pc is not as high a priority as it once was for them as the console market has exploded and they actually get return on investment. Too many pirated versions of pc software is a turn off.